I love leftover grilled chicken, the smoky grill flavor stays as long as it’s edible and provides an extra layer of flavor to whatever it’s used in. This recipe features chicken grilled over charcoal the night before as well as pickled banana peppers in a spread for sandwiches or wraps. I was in a hurry to work one afternoon when I lived outside of Chicago. I stopped at a gas station that had a pizza counter for a quick meal. Under a heat lamp I noticed a couple of burgers wrapped in foil with a yellow starburst sticker that said “Pizza”. I took a chance, grabbed two and was on my way. The burgers featured a marinara sauce, mozzarella cheese, pepperoni and a kicker - banana peppers! The tart and spicy peppers had a great flavor of their own and really gave this burger it’s “pizza or Italian” mojo. This tasty treat became a guilty-pleasure for an occasional lunch until I left the area and moved to Austin — and I have kept a jar banana peppers in my kitchen ever since. In this recipe the peppers impart a tangy and spicy kick and make for a nice compliment to the smoky-grill flavor of the chicken. The chives provide a hint of onion and there is just enough mayo to bind everything together. As a whole, it's a great filler for a sandwich or could hold up as the star of a bite-size appetizer. To cut carbs I served the chicken salad on cucumber, which provided a garden-fresh vehicle to deliver the goods and made for a nice replacement to carb-loaded bread slices or a wrap. In a large bowl mix together the chicken, banana peppers, chives and mayo until well incorporated, let rest 20 minutes for flavors to meld. 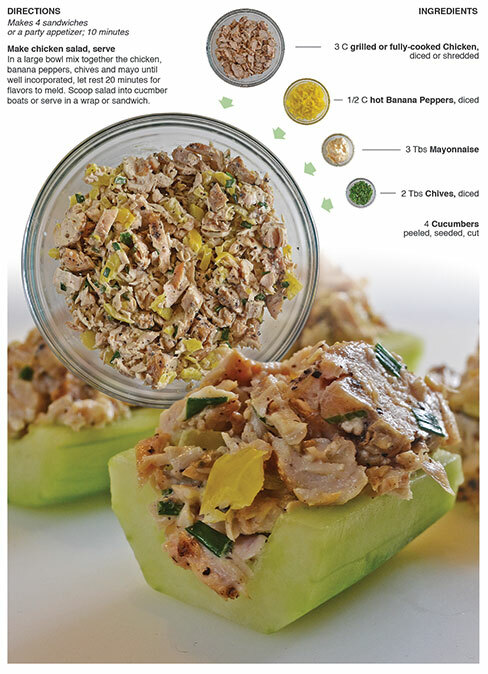 Scoop salad into cucumber boats or serve in a wrap or sandwich. OK wow this looks great! I bet your Chipotle Ranch Sauce (http://www.behindthebites.com/2013/11/chipotle-ranch-sauce.html) would actually be really great with this too? I think I will also try this with with curry powder mixed into the mayo or even season the chicken with it. Oh boy, thanks for lunches for the week! This is going to be awesome in an avocado (for minimal carbs!). The Double Turkey Burger Eggplant Stack!